Dance Commentary by Heather Desaulniers: "Giselle"
It’s hard to get a more ‘classical ballet experience’ than the opening night of “Giselle”. And you cannot get a better choreographic and artistic interpretation of the two-Act story than at San Francisco Ballet. Artistic Director Helgi Tomasson’s 1999 version (currently running as the season’s second program) offers a lavish yet accurate setting; vibrant, dimensional characters; complex and stunning choreography; and a story, while full of twists and turns, that is ultimately about love, sacrifice and redemption. Act I opens as a country glen sleepily greets the new day. Quickly, the scene comes to life and we are introduced to the primary cast of players - Giselle (danced by Maria Kochetkova), Count Albrecht (Vitor Luiz), Hilarion (Pascal Molat), and a host of villagers and peasants. With springy coupé jetés and bright ballonés, Kochetkova’s opening petit allegro sequence was like the rising sun. This early-established joy marked her every interaction in the first half of Act I, no matter how small or how significant. From meeting and falling for Albrecht to dancing with her friends to talking with Berthe (Katita Waldo), her demeanor: the epitome of hopefulness. Kochetkova’s Giselle definitely had the requisite naïveté but her characterization really was unique. The innocence was underscored by a delicate and lovable shy quality that captivated everyone in the room, most importantly, her Albrecht. Luiz’s Albrecht was phenomenal; he was able to complete the role’s technical demands while never surrendering the character’s depth. Albrecht is a complicated guy. In the course of two hours, he goes through an intense range of emotions - immaturity, freedom, selfishness, infatuation, love, despair, hope and acceptance. Many dancers are able to do the choreography and do the drama, but not necessarily at the same time. Luiz never once lost the integrity of his characterization, even in the midst of multiple pirouettes and dizzyingly sharp batterie. A favorite sequence of mine, the peasant pas de cinq was performed on opening night by five dancers from the company’s soloist tier (Clara Blanco, Sasha De Sola, Koto Ishihara, Daniel Deivison-Oliveira and Hansuke Yamamoto). Both Yamamoto and Deivison-Oliveira have the most incredible power; they use every ounce of their demi-plié to catapult them forward: into the air, into a turn, into a balance. At times, the women’s arms got a little too flouncy, which took away from the choreographic strength and rigor of Tomasson’s variations. Having said that, new soloist Ishihara must be singled out for her technically sound and consistent performance. As Act I came to a close, the ‘Mad Scene’ approached. 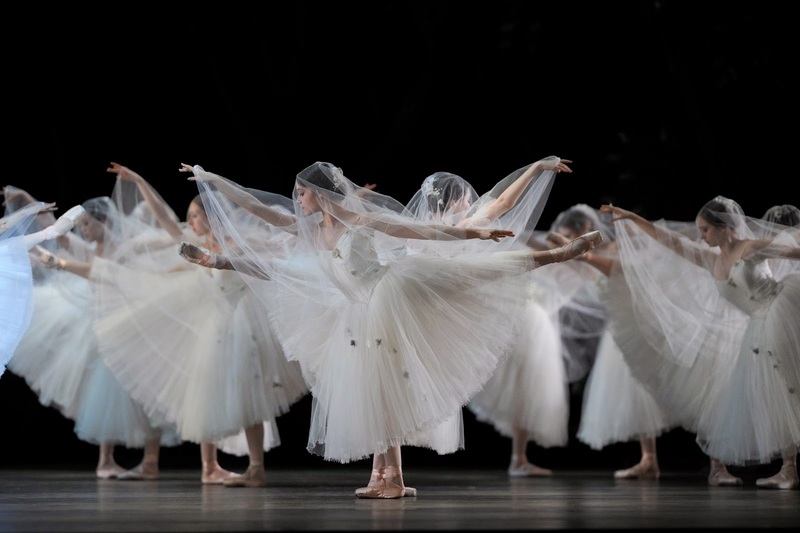 Upon learning that Albrecht is engaged, Giselle’s emotional and physical state decomposes, with a tragic result. A brilliant technician, Kochetkova showed her dramatic prowess as the despondent Giselle. Inner turmoil abounded and as you watched her face, you truly believed that she had transported herself to another plane. Kochetkova’s was a subtle yet eerie unraveling; like a slow motion descent into the abyss of heartbreak. San Francisco Ballet in Tomasson's "Giselle"
high extensions, and the arabesque ‘chug’ sequence was absolute perfection. Tomasson’s Act II choreography is technically intricate but I hadn’t noticed its narrative complexity before last night. Suspensions spoke of faith and were followed by falls of despair. While strong and defiant, the movement also had this unbelievable sadness that made such an important conceptual contribution. And one of my favorite images from Act II was Kochetkova in Giselle’s famous batterie sequence. She looked like an angel soaring above the earth.